The aim of this study was to perform a 'source-to-sink' matching exercise on five selected industrial sectors in non-OECD countries, in order to determine the potential for industrial CCS deployment. This assessment was completed within the greater context of the UNIDO 'Global Technology Roadmap for CCS in Industry' assessment. 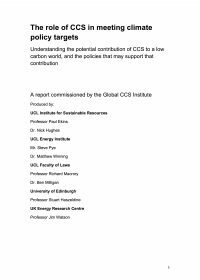 As such, this study serves as a basis for identifying some key tasks that will need to be undertaken if industrial CCS deployment is to advance to a level that is necessary for achieving global GHG emission reduction targets by 2050. The analysis performed here, which uses a qualitative source-to-sink matching approach to pair industrial CO2 sources with geological formations seen as potentially holding sufficient CO2 storage capacity, focuses on eleven non-OECD regions throughout the world. 이 연구의 목표는 산업에서의 CCS 보급에 대한 잠재력을 판정하기 위하여 비(非)OECD 국가에서 선정된 다섯 가지 산업 부문에서 ‘소스-싱크’ 매칭 운동을 수행하는 것이었다. 이 평가는 UNIDO의 “산업 CCS를 위한 국제 기술 로드맵” 평가의 더 큰 맥락 안에서 완성되었다. 따라서, 본 연구는 산업 CCS 보급이 2050년까지 글로벌 온실 가스 (GHG) 배출 감소 목표를 달성하기 위해 필요한 수준에 도달하기 위해 필요한 몇 가지 주요 임무를 밝혀내기 위한 기본자료의 역할을 한다. 여기에서 수행된 분석은 전 세계의 열한(11)곳의 비 OECD 지역에 주력하며, 소스-싱크 매칭 접근을 사용해 산업적 CO2 배출원을 잠재적으로 충분한 CO2 저장 용량을 보유한 것으로 보이는 지질학적 구조와 매칭한다. 본 평가에서는 발전(發電) 부문을 제외하고 제조업과 바이오연료 생산 부문에 대한 BECCS 적용에 초점을 맞추었다. 2020년과 2050년을 대상으로 예측한 결과에 따르면, 제조업 및 바이오연료 생산에 바이오매스 기반 CCS를 연계하는 것은 매우 중요하다. 그러므로 본 평가서에서는 각종 CCS 활용 바이오연료 생산 컨셉을 심도있게 다룰 것이다. This report provides an overview of the potential application of carbon capture and storage technologies to refineries. It describes the industry today, including its CO2 emissions and goes on to analyse various ways in which CO2 capture technology could be applied. It looks at legislative influences, costs and concludes by identifying challenges and recommended next steps. Transport and storage aspects of CCS are only touched upon as they are common with other industries.